PHOENIX — Following the recent interception and impoundment of multiple quagga mussel-fouled watercraft that had been in Lake Powell or Lake Havasu for extended periods, the Arizona Game and Fish Department reminds boaters to “clean, drain and dry” – and especially decontaminate — their watercraft and equipment before exiting waters designated as having aquatic invasive species. Five vessels from Arizona waters have been impounded during the past month — three in Idaho and two in Colorado. 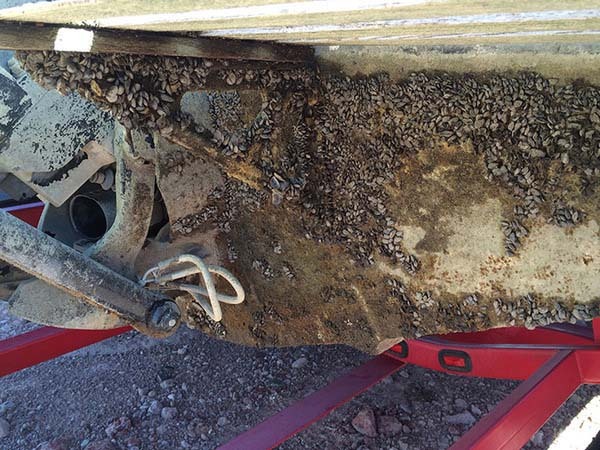 “There is absolutely no reason why boaters are not decontaminating moored boats before leaving a quagga mussel-infected water,” said Chris Cantrell, AZGFD’s Aquatic Wildlife Branch Chief. AZGFD recently contracted with a local business to provide free decontaminations for those with boats that have been on a quagga mussel-infected water for more than five consecutive days. If a boater plans on selling or moving a boat from one of the infected waters, please call AZGFD at (623) 236-7608 or Woods to Water Wildlife Solutions, LLC at (602) 920-4891. “This way, we can help assist you with the required decontamination to ensure you stay compliant with multiple state and federal laws,” Cantrell said. * CLEAN. Clean/remove any clinging material from the anchor, boat, motor and hull, trailer (all plants, animals and mud). * DRAIN. Remove all water drainage plugs (and keep them out during transport). Drain the water from the bilge, live-well and any other compartments that holds water. Drain the water from the engine and engine cooling system(s). You can do this by lowering the outboard, while on the ramp, until the water is removed. * DRY. Ensure the watercraft, vehicle, equipment, or conveyance is allowed to dry completely before placing in another water in Arizona. Leaving your plugs out during transport will assist in ventilating and speeding the drying time of those difficult-to-dry areas of your boat. There are additional steps to complete for watercraft that have been on AIS-listed waters for six or more consecutive days. See more information on all statewide decontamination protocols, how to schedule a no-fee decontamination, an intro to invasive quagga mussels, and the Director’s Orders lists of aquatic invasive species and waters.